. 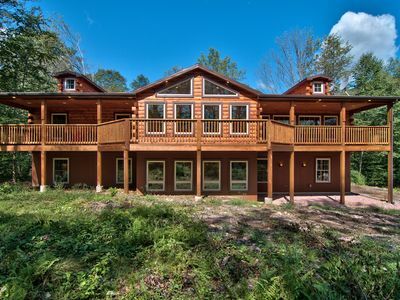 This is one of our most popular houses--especially in the summer, since it is not only lakefront, but it also has an inground swimming pool! 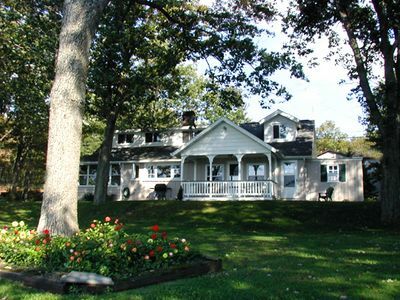 BUT---we are into spring rentals now--please plan ahead for next summer, , and your group will need to check the calendar for other dates. Linens are not provided.
. The pool is only open from shortly before Memorial Day until the end of September, but there is also the view and lake to enjoy (weather permitting)---you get 2 boats and your own dock with the rental, and we also have a hot tub, so even in seasons other than summer, this is still a fantastic place to stay--and a real steal! Other than summer and holidays, we charge by group size---and at much lower rates than other comparable properties! We rent by weekend, week, or take a really low priced midweek stay. 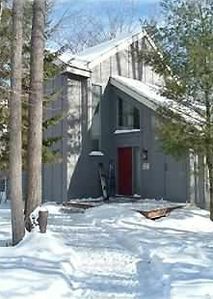 Our rates make this lakefront home affordable for even couples--who usually never get to stay lakefront (this is a great place for a low cost honeymoon--especially if you go Sunday to Thurs--maximum midweek rental! We can sleep up to 8 (but maximum of 6 adults and 2 children). Please do not ask us to 'squeeze' in larger parties! If you want to stay longer (or your dates include holidays), please email for a quote! Just email us and we will verify the total rental cost and give you directions on how to proceed with the lease (we email to you) and payments. 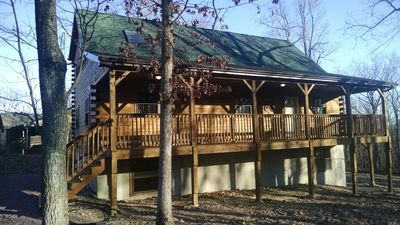 AND for you romantics--we have a roomy five person Thermospa hot tub on Trex deck overlooking the lake--and you have total privacy in this hot tub, too---you cannot see another house from the tub! 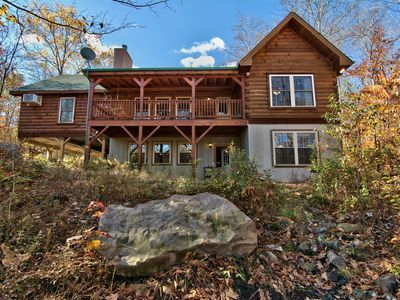 We are very conveniently located within 5-6 mile of the Pocono exit for the PA Turnpike, only 2 miles from a Route 80 exit (White Haven--by the very nice Powerhouse restaurant-perfect for a special dinner/night out), and only 10 miles from Jack Frost/Big Boulder--if you want a skiing/tubing getaway! 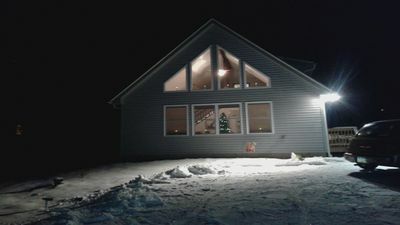 And after a day on the slopes, you get to come home to a contemporary, well maintained home with a private view of the lake--and you will get to appreciate it from the hot tub! 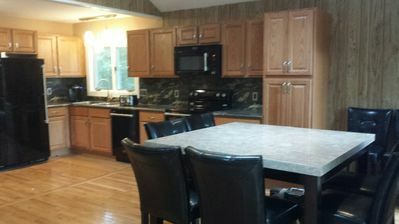 All the furniture is high quality, the kitchen is fully equipped with pots, pans, dishes, glassware, etc. and there is a sliding glass door from the kitchen overlooking the deck, pool, and lake. 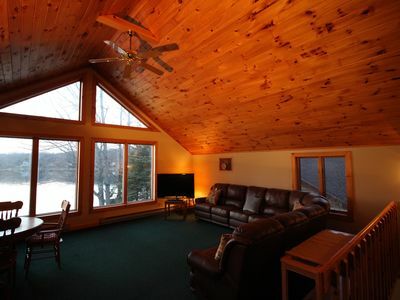 The very large master bedroom also has a double window overlooking the lake. In warmer weather, you can have coffee or your meals on the deck (or after dinner drinks) for a wonderful experience! And it's always so nice to just look out onto the lake instead of onto another property! We have a firepit and picnic table closer to the lake if you want to toast some marshmallows or just enjoy the ambiance of a fire at night. 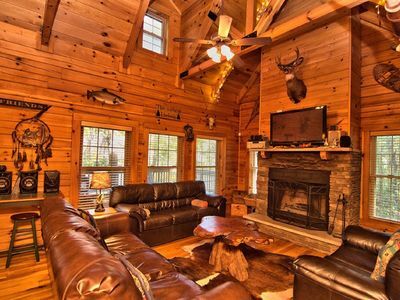 There are so many things to do in the off seasons (spring, fall and winter) and at such a discounted price--that this home is really a bargain for your group! We are within 4 miles of the White Haven access area of the Lehigh Gorge State Park, which is a 26 mile multi purpose trail next to the Lehigh River--so you can hike or bike all the way to Jim Thorpe if you want! 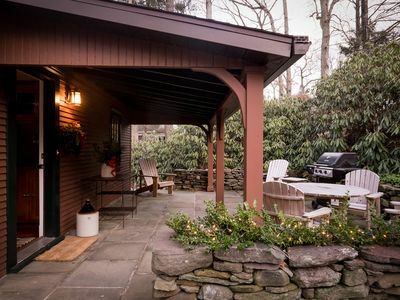 You can spend a day exploring lovely Jim Thorpe (Switzerland of Pennsylvania), or stay at home and save money by cooking at the house, either in the new kitchen or using the grill on our full deck overlooking the lake. But if you want to go out to eat, there are plenty of restaurants in the area, ranging from hamburger hangouts to special occasion dining. We are only an easy 15 minute (at most) drive to Big Boulder or Jack Frost for skiing or tubing--then come home to relax in the hot tub! 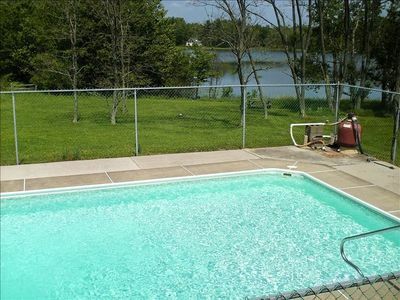 For summer renters, we open the pool right before Memorial Day, and it stays open through the end of September (and we have a passive solar heating system that raises the water temperature about 5 to 8 degrees). Check for your dates early---we have rented the entire summer by May in the past years! We usually spilt summer rentals into 3 payments. 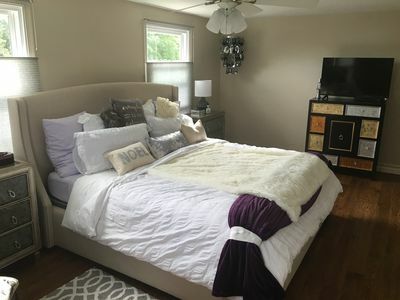 The house is very nicely furnished with a roomy master bedroom and full kitchen, and this home has great lake views from 2 bedrooms and the kitchen. There is a quiet high efficiency Mitsubishi in wall A/C unit that does the whole floor, so no heat wave worries! 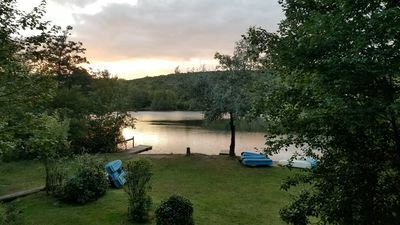 In addition to the inground pool, you also have the use of your own dock with 2 boats (life jackets provided) and a private firepit with a picnic table right by the lake. We are on Lake Agmar, an approx 25 acre lake (no motorboats) with great fishing---mostly sunnies and large mouth bass. 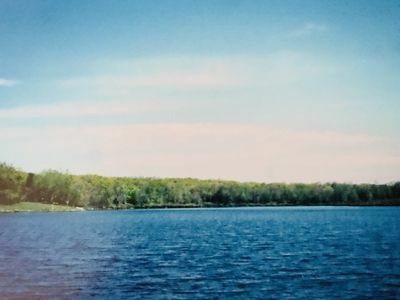 The lake is within 5 miles of the Poconos exit of the PA Turnpike, and within 2 miles of Route 80 (White Haven exit), so it is easy to get to, and has no backroads driving. We are also very close to the town of White Haven, so you do not have to travel far for a food store, gas station, drugstore, liquor store, pizza, restaurants, etc. 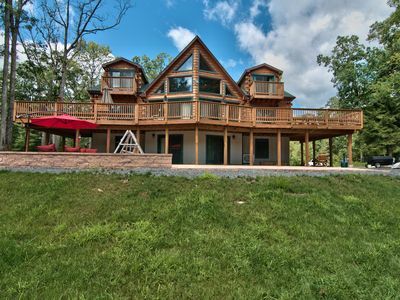 We are right off Route 80 in White Haven, and close to the PA Turnpike Pocono exit---so you will not spend all your vacation time driving! 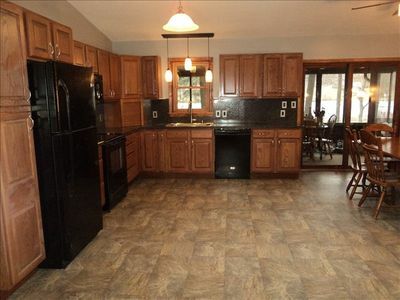 This updated home has an new kitchen with quality cookware, the rest of the home has new furniture including an 55' LED TV in the living room with upgraded cable and a collection of recent DVDs. One of the bedrooms also has a 37' flat screen TV. And we have a very roomy master bedroom (king bed) with a large private bath. 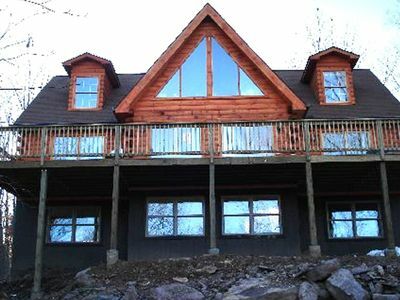 That bedroom has a large (78' x 60') window overlooking the lake, so you can really enjoy the view! We have internet access and free WIFI. The large deck overlooks the pool and the lake, and is the perfect place for morning coffee, a romantic nightcap, or any outdoor meal when the weather is warm enough. It was designed so no other homes can see you while you are on the deck, so you will have privacy. Jack Frost and Big Bolder ski slopes, H2OOO indoor water park, horseback riding, outlet shopping and the Mohegan Sun Casino are all within a half hour (or less) drive. Great special occasion restaurant (or just for a nice lunch or dinner) less than 5 minutes away. Click the link on this site for the Powerhouse restaurant. You can even enlarge the directions map and find Lake Agmar (our location). We are located near the Pocono exit of the PA Turnpike, right off Route 80 just outside the town of White Haven. If you want to find Lake Agmar on Mapquest, look for the intersection of 940 and Lakeside Road in White Haven, 18661. There are loungers and other chairs around the pool for sunning, in addition to outdoor furniture and a top of the line stainless steel grill on the very roomy deck. Only 2 steps out front to get into the house, so it is easily accessible for those who have difficulty climbing stairs. 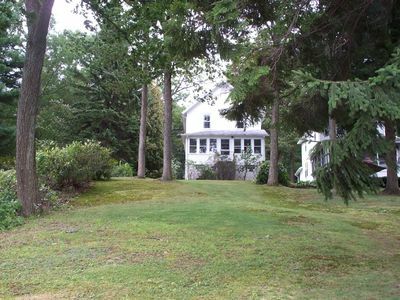 There is a driveway that holds 2 cars and an additional space for one car in front of the house on the street. 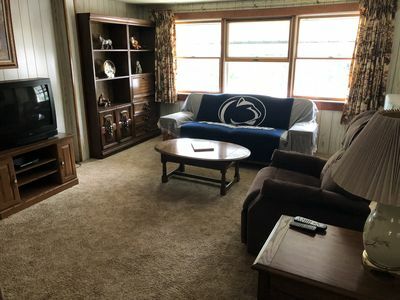 This house is perfect for a romantic weekend or even a honeymoon, a family vacation, a girls' getaway, or just a quick vacation for singles or couples with pets (We have found pet owners to be very responsible, and pets love all the roaming room out back). But since this is a smaller house, we allow only 2 dogs at most. We do not rent to young groups (proms, etc.). 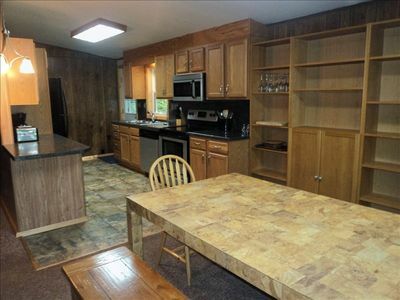 There is a $400 security deposit and a $85 cleaning fee. 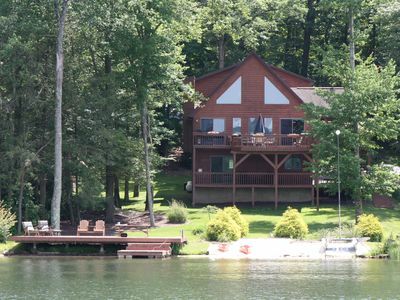 Large Lakefront-- Hot Tub, Pool Table, HDTV, Dock, Boats!